There's a lot of confusion about canola oil. Is it healthy or not? Some oils are definitely health promoting. Oils such as flax and walnut which are high in omega-3's are powerful inflammation fighters. We also like butter and ghee from pasture raised cows for their omega-3 benefits. Olive oil, coconut oil, palm oil and avocado oil are also healthy choices. Then there are the unhealthy oils such as corn, soy, cottonseed,sunflower, safflower and mixed vegetable oils. These are all high in omega-6s and create inflammation in the body. Where does canola oil fit in? Well, some forms of canola are unhealthy and others are okay, although not exceptionally health-promoting. 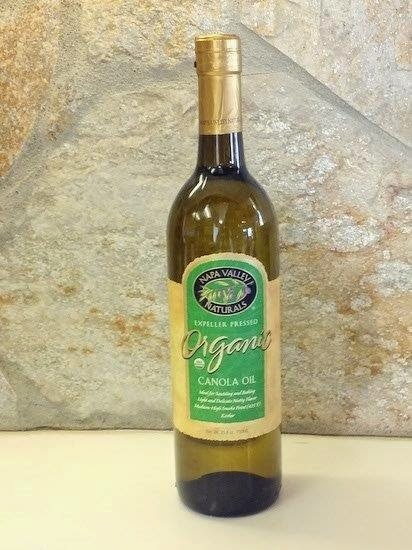 Canola oil is 21% omega 6 and 11 % omega 3 so although it falls within the accepted ratios (for anti-inflammation, oils should be 2-1 or 1-1), it is not particularly healing like flax oil which is 18% omega 6 and a whopping 57% omega 3. However, canola has some benefits for the cook. We like it for times when a tasteless oil is preferred, such as in mayonnaise. It's probably best not to use it frequently, but instead, pull it out of the cupboard when you're making a special dish that will benefit from its quiet taste. Don't just buy any canola oil, however. Some versions are not good for you. The only acceptable version of canola is organic expeller pressed canola, but only when used in food preparation without heat. Heating causes oxidation and oxidation creates inflammation in the body. Expeller pressed oil is removed from its nut or seed source by a screw press machine, without the harsh chemicals used in other methods. This process can generate heat, however, which causes oxidation, so it is important to buy oil that is cold-pressed, in a temperature controlled environment. What's wrong with regular supermarket canola oil? Regular canola oil goes through the process of caustic refining, bleaching and degumming, which involve high temperatures or chemicals of questionable safety. Canola is high in omega-3 fatty acids which easily become rancid and foul smelling when subjected to oxygen and high temperatures so it is then deodorized, a process which removes a lot of the omega-3 fatty acids by turning them into trans fatty acids. Trans fatty acids cause inflammation. Because canola goes rancid easily, keep it in the refrigerator along with your walnut, sesame and flax oils.